A couple of days ago, I brought up the issue of beauty. I thought I might give an example of what passes for beauty in my eye. 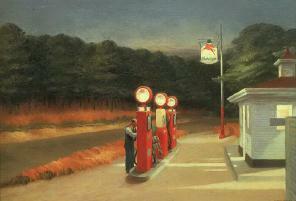 The above is Edward Hopper’s “Gas”. Though I don’t think this is his absolute best piece of art, I do find it strongly compelling. It speaks to me. I relate to it (and other Hopper paintings) in a way I don’t or can’t relate to other artists. This, of course, is Jackson Pollock’s “Number 1”. Now, to me this is more a disorganized construct (a contradiction?). Something to puzzle over; something to disassemble and reassemble. It’s almost as it’s a problem to be solved. I’m not saying there’s no beauty here; it’s just that I don’t recognize it. Now, I’m wondering why this is. Why does Hopper outstrip Pollock in the recesses of my mind? Is it a lack of formal artistic education? Do environmental aspects come into play? Am I just being “ignorant”? What, pray tell, is it?